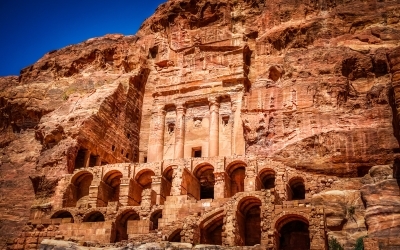 The True Indulgence vacation package offers the ultimate Jordanian travel experience with travel to Amman, Petra, Wadi Rum and the Dead Sea Jordan. It perfectly combines fascinating history in Amman, extraordinary art in Petra, magical desert landscapes in Wadi Rum and unspoiled relaxation at the Dead Sea Jordan. Indulge your senses with a spectacular trip through Jordan’s luxurious resorts and boutique accommodations, delectable culinary experiences and once in a life time experiences! Welcome to Jordan! Meet your True Trips host at the airport in Amman, and make your way to your luxurious Amman hotel for your first night in the country. Get settled in and prepare to be dazzled by Amman’s alluring mix of authentic neighborhoods, classic Middle Eastern architecture and distinct contemporary vibe. Head out to explore the city alongside your expert True Trips guide and discover the city’s impressive sights like, The Citadel, The Roman Amphitheater and King Abdullah Mosque. Venture outside the city of Amman to explore the Ancient City of Jerash, a true gem of immense historical significance! Walk on its ancient cobbled streets and visit the beautifully preserved Oval Forum, the Hippodrome and the ancient theater. During your time in Amman be sure to visit Rainbow Street for some shopping. Walk through its winding alleys and take in the traditional Jordanian street life in the city’s most atmospheric neighborhood! If you are looking for a more fashionable shopping experience then a visit to “The Boulevard” is your best option. 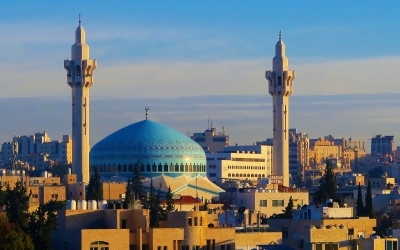 Amman is a fascinating Middle Eastern capital waiting to be explored! Today you’re off to Petra, the undisputed jewel in the crown of Jordan! Your journey into the magical world of this ancient Nabatean city begins at the natural passage known as “The Siq”. Follow your expert True Trips guide as you navigate through the rock crevices and patiently tread the winding path that leads to the ancient city. Your effort will be infinitely rewarded at the end with the truly brilliant sight of the “Treasury”. This magnificent building, carved out of red sandstone is only the beginning of your journey. You could spend days exploring Petra and still not see everything as the ancient site is home to a number of incredible works of architecture, sculpture and art! If you are feeling adventurous, a visit to the Monastery, will expose a less visited, but truly stunning aspect of Petra, well worth the three mile hike and the 850 steps! And if Petra wasn’t spectacular enough during the day, a visit during the night will almost definitely render anyone speechless. Decorated with hundreds of candles and seated amongst the ancient ruins of the Treasury, this remarkable scene will set the tone for a truly enchanting journey into the culture, traditions and history of Jordan, Petra and the Nabatean people. 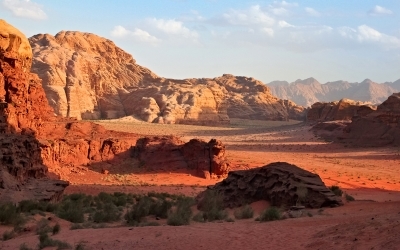 Welcome to Wadi Rum, one of most breathtaking and awe-inspiring regions of Jordan! Your adventure into the historic and mesmerizing landscape of Wadi Rum will begin before you even reach your accommodation as the only way to get there is to climb aboard a 4x4 jeep, traverse the desert’s colorful sand dunes and navigate through its towering rock formations! Once you have checked-in to your unique Bedouin accommodations, take some time to appreciate your surroundings, the sand, the warm air, the iridescent blue sky, the hot sun and the distinct desert aroma. Choose your mode of transport and venture into the desert alongside your Bedouin guide to explore one of Jordan’s finest gems. Discover the story of Lawrence of Arabia, walk on otherworldly landscapes and surf on multicolored dunes. Come nightfall, you needs only turn your gaze upwards to witness a spectacle of exceptional rarity as millions of stars, planets and even the Milky Way adorn the evening sky. Immerse yourself in the Bedouin lifestyle, eat Zarb, drink hot tea and coffee and sleep under the stars in total seclusion and darkness. A true masterpiece of nature! Welcome to your luxury Dead Sea hotel! 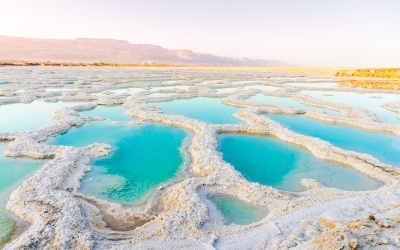 Once you’ve settled in, put on your swimming gear and head to the beach for one of the most exhilarating and peculiar experiences of your life as you step into the deep blue waters of the Dead Sea and float on the surface if you weighed nothing! Swimming is impossible, so float around or cover yourself with the sea’s therapeutic mud. Either way you will leave feeling rejuvenated by the end of the day. Venture outside your hotel resort to explore the settlement of Bethany where it is believed that John the Baptist baptized Jesus and visit the ancient remains that include structures dating back to the 1st Century AD. Continue your exploration with the desert castles that dot the Jordanian landscape. Built by the early Islamic Umayyad Caliphs, castles such Qasr Amra, Qasr Kharaneh and Qasr Azraq are beautifully preserved samples of Umayyad Art and architecture. By finishing your journey at the Dead Sea, we are confident that you will return home relaxed and thoroughly rejuvenated!